Guiyang unfurls itself over mystical mountains, wild bamboo and ancient pine forests, and glides across the rippling depths of Nanming River, bursting onto the city streets in a dazzling display of colour and culture. 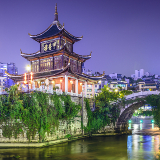 Guiyang is home to over 3 million and the capital of the Guizhou Province. Attractions include Qingyan Ancient Town, Qianlingshan Park and Jiaxiu Building. 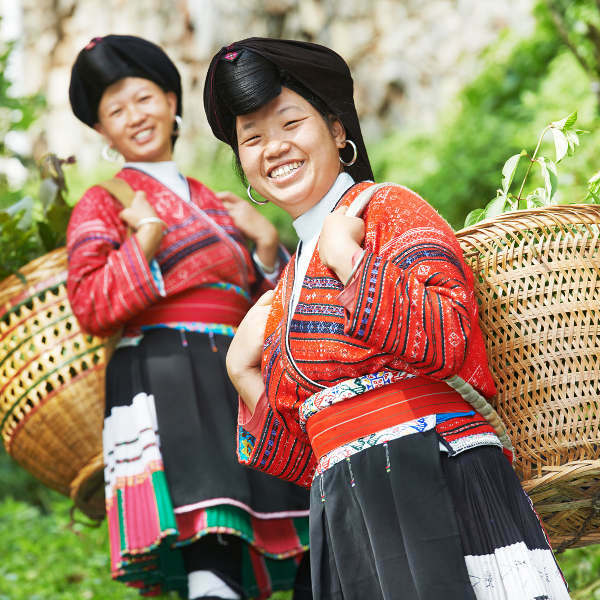 Delve into the bewitching history, culture and natural landscapes of China with cheap flights to Guiyang. Guiyang is home to Guiyang Longdongbao International Airport (KWE), which is a 40-minute drive from the city centre. Legends of Butterfly Mama and her twelve eggs is embroidered into the colourful cloth of the Miao, while Dong folklore tells of Goddess Sasui and twelve sons. Culture suffuses the delicate landscapes of Guiyang. Guiyang is famed for its natural beauty. Qianling Mountain is a majestic haven for wild forests, glittering springs, mysterious caves, sacred temples, medicinal herbs, curious animal life and exotic plants. Wander the streets of downtown Guiyang or venture into the mountains to discover spellbinding architecture dating to the Ming Dynasty. White stone parapets and intricate carvings whisper of lost worlds. Guiyang is situated in a subtropical zone. It experiences a monsoon climate, with ample rainfall and pleasant temperatures. Guiyang is often called ‘Another Spring City’ because of its consistently pleasant climate. 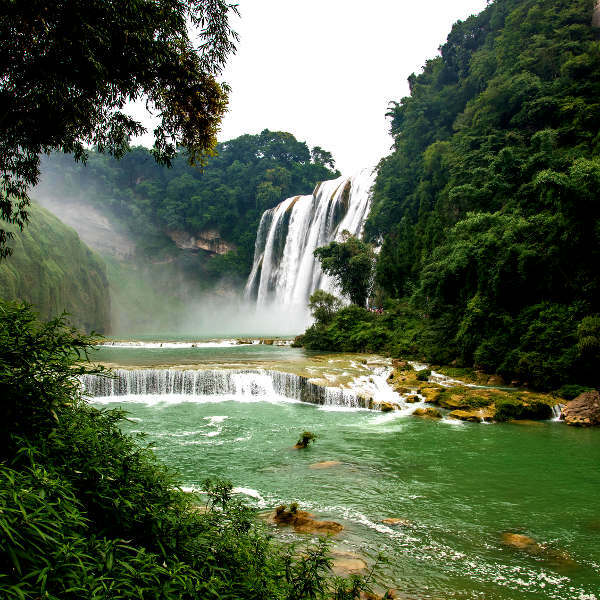 Summer (June to September) is a great time to witness the sheer beauty of Qianling Mountain and the Huangguoshu Waterfalls. The summer weather is comfortable, with average highs climbing to 28 degrees Celsius and lows sinking to 17 degrees Celsius. Winter (December to February) is wet and cold, with seemingly endless drizzles, and occasional snowfall. Temperatures range from average highs of 11 degrees Celsius to lows of 2 degrees Celsius. Temperatures occasionally dip toward -10 degrees Celsius. Winter is a great time to experience traditional festivals such as San Yue San, Si Yue Ba, Di Xi and Liu Yue Liu. Spring (March to May) and autumn (October to November) also offers pleasant weather and sublime landscapes. Guiyang is a romantic paradise and cultural oasis situated in the heart of China. Enchanting mountains bulging with wild tangles of curious plant life and ancient pines bristle with the spirited chitter-chatter of exotic birds and monkeys. These same mountains offer a haven for steaming hot springs, shimmering rivers and plunging caves. 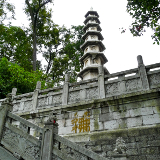 Discovered as early as 1283 AD, during the Yuan Dynasty, Guiyang whispers of ancient dynasties and sacred civilisations. 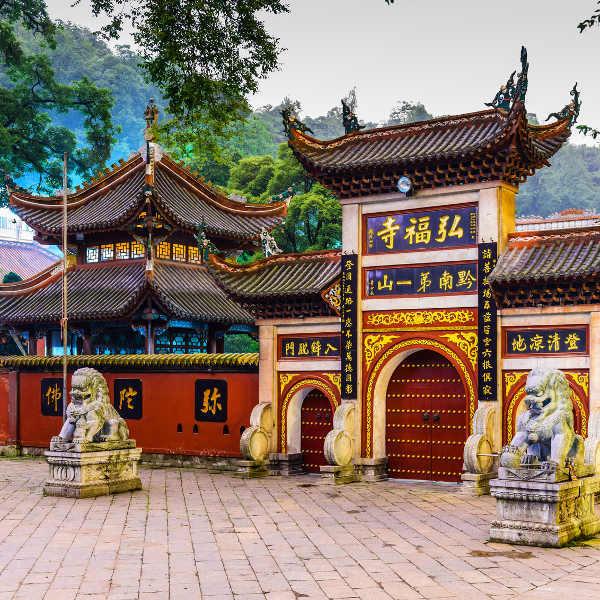 Sacred temples steeped in history and traditional villages of ethnic minorities keep the rich culture of Guiyang alive. Explore the lush gardens of Qianling Park or age-old buildings of Qingyan Ancient Town. 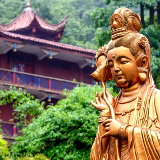 Feel the divine touch of Buddhism in Hongfu Temple or search for rare antiques on Jiaxiu Pavilion. Guiyang welcomes you to feel the beating heart of Guizhou Province. Compare several airlines, and book your cheap flights to Guiyang online at Travelstart! Guiyang is relatively safe. However, crime happens everywhere, so you should still take the usual precautions and use common sense, as you would in any other unfamiliar city. Travel insurance to cover theft and medical expenses is highly recommended. Avoid public demonstrations and political rallies. Leave important documents or valuable items in the hotel safe and remain vigilant of pick-pocketing in crowded areas and on public transportation. Women should exercise caution when travelling alone and avoid venturing out alone at night. China is affected by natural disasters such as flooding, earthquakes and typhoons. Remain up to date by following news reports and emergency channels. Proof of yellow fever vaccination is required if you are travelling from an infected area. Other routine and recommended vaccinations include hepatitis A & B, typhoid, tetanus, diphtheria, polio, rabies, malaria, tuberculosis and Japanese Encephalitis. Accommodation in Guiyang is a masterfully curated selection of hotels, inns, hostels and home-style apartments. Stay downtown and you will be treated to high rise hotels adorned with regal décor and luxurious trimmings. Marble bathrooms, rooftop terraces overlooking the majestic landscape and facilities such as nightclubs and ritzy restaurants serving world class fare invite you to relax and indulge. Downtown offers easy access to restaurants, entertainment and attractions. For something a bit more low-key, garden inns and home-style apartments offer comfortable accommodation without the hefty price tag. Expect sophisticated interiors infused with traditional Chinese elements and facilities such as tour desks, car hire, and all the comforts of home. These establishments can be found scattered around the city. A number of budget establishments are also available throughout Guiyang. Guiyang is the transportation hub of Guizhou Province, so the public transportation system is extremely efficient and reliable. Taxis are the easiest way to get around the city. They are available in abundance and can be flagged on the street or pre-booked by telephone. Taxis should be clearly marked. Fares are charged per kilometre and increase at night. Public and sightseeing buses operates extensively throughout the city. Buses are considered the best and cheapest way to get around the city. Fare is usually only between 1 to 2 Yuan. Bicycles are the most popular and widely used mode of transportation amongst locals. It offers a fun and easy way to explore the city and experience the superb weather. Car rental agencies are also scattered around the city. Car rental is a great option if you intend to venture beyond the boundaries of the city.